NORTHERN Ireland relies on imports from the European Union to a greater extent than previously understood, new government figures have revealed. Annual statistics have been dramatically revised to the extent that 2014, which was originally said to have experienced a £239million trade surplus for Northern Ireland, is now shown to have experienced a deficit of over £2billion. The fresh data has led civil servants at Stormont to revise a key finding of their research into the likely impact of leaving the European Union (EU). Previous research published by Stormont in January 2016 used data from Her Majesty’s Revenue and Customs (HMRC) to conclude that Northern Ireland exported more to the EU than it imported. But now revised figures have dramatically overturned the finding, revealing instead that Northern Ireland imports much more from the EU than it exports. 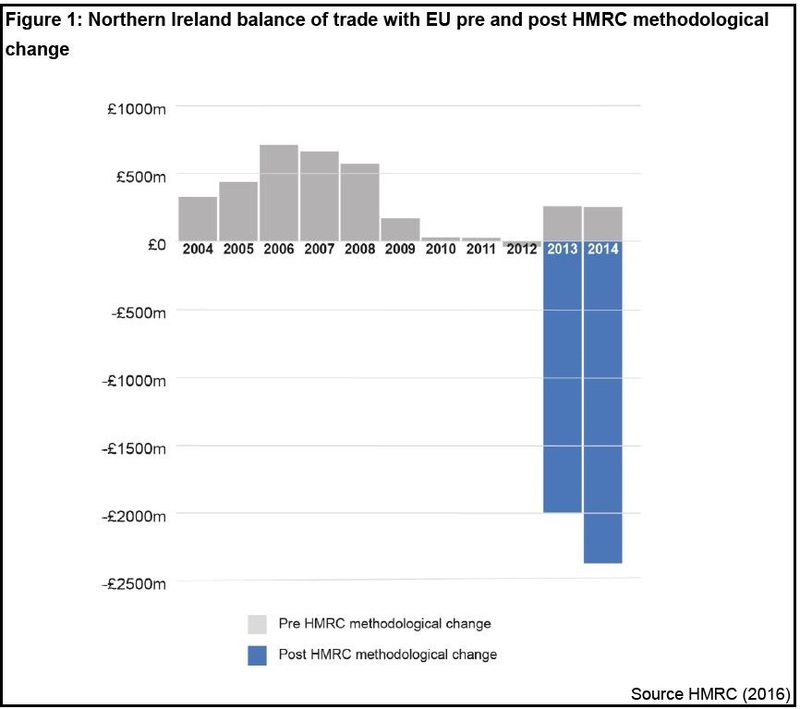 As shown in the graph above released by the Northern Ireland Assembly, the original findings (in grey) suggested Northern Ireland had a trade surplus of £239million in 2014. However, the revised research (in blue) shows that Northern Ireland actually imported much more from Europe than it exported, representing a trade deficit of more than £2billion. The HMRC trade statistics previously related to where companies based their headquarters, but the new figures focus instead on where firms have the bulk of their workforce. The swing in the trade balance comes as Brexit negotiations between the UK government and the European Union got underway this week. Parties in Northern Ireland remain divided on the prospect of Brexit, though in the UK’s 2016 referendum on EU membership a majority of voters in Northern Ireland opted to remain inside the EU. Neil Gibson is the Director of Ulster University’s Economic Policy Centre. Commenting on the revision of the trade figures, he said: “Trade statistics are complex and prior to the decision to leave the EU they rarely received much attention. He warned against drawing firm conclusions and said companies may carry out different activities in different regions. The Stormont analysis, prepared by the Northern Ireland Assembly Research and Information Service, said that a significant proportion of the increase in imports into Northern Ireland relates to machinery and transport goods. He added: “We’re a small regional economy, with limited natural resources and a small domestic marketplace. There are well articulated concerns about being able to easily and competitively export post-Brexit, but businesses and domestic consumers could face financial pressure caused by delays and a sharp increase in costs for imports too. The new methodology was adapted by HMRC at the end of last year and has been applied in the new Stormont research paper for the years 2013 and 2014. Neil Gibson from Ulster University said the trading picture was likely to become more volatile. “Trade data in a region such as Northern Ireland is dominated by a relatively small number of large firms, particularly manufacturers, meaning the data can be relatively volatile which further adds to the complexity in drawing firm conclusions. The recent closures of JTI and Michelin for example will have a material impact on trade figures. The Detail previously reported on how Stormont officials highlighted the potential risks of Brexit a year before the EU referendum.